VP Erich is going to participate in the “End Polio Trans-Sabah Walk and Climb” from 7 to 18 November 2011. He talked about this upcoming walking event during the lunch meeting held on 24 Oct 2011. Rtn Rene, supported by PP Peter, was the SAA. PP Bruno was invited by President Mavis to give the international toast. RCQS members were pleased to welcome former RCQS member PP Shirley M S Kwok as well as two visiting Rotarians and two guests. Visiting Rotarian Mr Shin from RC Seoul Namsan. 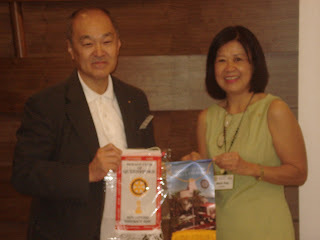 Mr Yoshida from RC Lajolla California and President Mavis exchanging club banners.